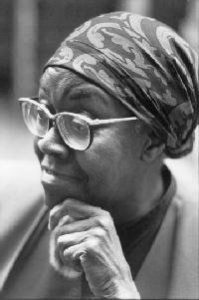 Gwendolyn Brooks (June 7, 1917 – December 3, 2000) was an award-winning African American woman poet. Born in Topeka, Kansas, she grew up in and remained in Chicago, Illinois. Although she also wrote a novel, an autobiography and some other prose works, she was noted primarily as a poet. Her 1949 book of poetry, Annie Allen, received a Pulitzer Prize, the first won by an African American. In 1968, she was made Poet Laureate of Illinois. Other awards she received included the Frost Medal, the Shelley Memorial Award, and an American Academy of Arts and Letters award. Her poetry is rooted in the poor and mostly African-American South Side of Chicago. She initially published her poetry as a columnist for the Chicago Defender, an African American newspaper. Although her poems range in style from traditional ballads and sonnets to using blues rhythms in free verse, her characters are often drawn from the poor inner city. Her bluesy poem We Real Cool is often found in school textbooks. She is seen as a leader of the Black Arts movement. After her first book of poetry was published in 1945, she received a Guggenheim Fellowship. After John F. Kennedy invited her to a Library of Congress poetry festival in 1962, she began a college teaching career which saw her teach at Columbia College Chicago, Northeastern Illinois University, Elmhurst College, Columbia University, Clay College of New York, and the University of Wisconsin. She was the 1985 Library of Congress’ Consultant in Poetry, a one year position whose title changed the next year to Poet Laureate Consultant in Poetry. In 1994, she was chosen as the National Endowment for the Humanities’s Jefferson Lecturer, one of the highest honors for American literature. WE REAL COOL SEEMS TO DEPICT THE MIND STATE OF LOST YOUTH THAT THINK ITS COOL TO RUN THE STREETS AND SKIP SCHOOL. BUT IT ALSO CAN HAVE ANOTHER MEANING SUCH AS GRADUATING FROM HIGH SCHOOL AND CELEBRATING. HOW WE INTERPRET THE POEM CAN BE OF A GREAT VALUE. Left school. We (emphasis). The remainder of the poem followed this pattern. Read in this manner truly reveals the underlying intent of the author which was not apparent to the casual reader. Comment No. 4 alludes to the use of “We” as having special meaning. I think this is a great poem to share with students who also think they are “real cool.” It sends a message that is relatable and realistic. It’s a deep poem in few words, which many students think can’t happen. My students are going to read this and then write their own “We Real…” poem, imitating Brooks’s style and simplicity. Coming across this site and the name Gwendolyn Brooks awakened in me the fondest memories of her. My contact with her was short, just a few weeks’ course in poetry at Northeastern Illinois in the 1960s, but my memory of them is incandescent. She was warm, welcoming, nurturing, understanding, sensitive to her students, truly interested in our efforts and always willing to give generously of her time outside the classroom; she took seriously my poetic attempts and encouraged me to do more; she was in that regard a mother to me, then a rather lost young man, and she nourished my soul. I loved then and still love her unique voice as I loved and love her human warmth. It was many years before I realized what she meant in my life, and I never had the chance to tell her or to thank her for the way and the extent to which she influenced and broadened my spirit, and too soon she was gone. This is an inadequate attempt to make amends. So, thank you, my Miss Brooks, for those unforgettable weeks of spiritual awakening, with their lifelong consequences, and for the permanent and invaluable gift of your poems. Awesome. It’s so direct and powerful. Just Amazing. I got to a drop-out school and there are so many kids who I would like to share this with. Kids who are runnin the streets, chasing the Hood dreams, Tryin’ to be “gagstas”. If they could only read this and understand that it ain’t so cool, that they have to get educated in order to truly free themselves from the shackles of poverty. If they could really read this poem and truly unerstand it, then they could see how foolish it is to play up to what the world expects us to be. Stupid. Where i’m from there are many teenagers who have dropped out of school. If they were to read this poem they would know you need an education to live. With out smarts you won’t make it. This poem can also be an inspiration to those who are in school now. It let’s them know stay in school nothing is in the streets. This poem “We Real Cool” is absolutely wonderful. I believe this because the meaning of this poem is expressed with very few words. This poem describes the essence of ghetto life. It describes the desperate; those who are in an extreme need of things other than money. Without really telling you anything about these seven young men Gwendolyn Brooks tells us all about them. This poem tells of their fears, their ambitions, and who they think they are versus who they really are. The poem begins with the word “We” which is the only line in the poem that begins in this such manor, despite the fact that the word we is repeated six more times, throughout the entirety of this poem. The “we” that I believe is represented at the beginning is the unity that comes from being with friends. There is no individuality. They are all in the same position. They are all, “real cool.” However, as the poem progresses the repeated “We” is seen not at the beginning but, at the end of each line. This simultaneously displays a certain aspect that was not seen in the first line. It shows a certain bluster and a distinct uncertainty about the groups identity or even, as an example of protesting too much, whether there’s a group identity at all. Who is this “We” that they are so insistent about? Repeated as it is, the “We” gets smaller and smaller–the poet has in fact said that the “we” is supposed to be read in a small and uncertain way, thus the reason for the unpunctuated “we” at the end of each line. That word becomes sort of a question as well as a refrain. The unity that was seen in the beginning becomes less and less apparent as the poem continues. Brooks continues the poem, saying, “We / Left school.” Making even more apparent the hopelessness of this scenario. Brooks not only arranges the wording in this poem to show a desperate need, but she speaks of one as well. The fact that these seven young men have no education shows exactly how bleak their future is or is going to be. It is also here that the unity of this group begins to fade. As the poem closes Brooks writes, “We / Die soon.” I believe this is the perfect closing to a poem about having a false since of unity, about the wrong path, and ghetto life in general. You come into the world alone and you are sure to die alone. My daughter, a seventh-grader, needed me to print a poem for a class assignment, and I remembered this one, long a favorite of mine. It’s short, but succinct. The imagery speaks of youth, posturing and belligerent, yet fatalistic about the ultimate outcome. The use of alliteration allows a quick build to the climax. Powerful poem, standing with few in it’s brevity.